Clubhouse opens at 7:00am daily. First tee time is at 8:00am, depending on the season - please call ahead. For a list of our programs click here, or visit the Blair Park Golf Course online resource. Please call Blair Park Golf Course for more information. Monday-Friday; $21 with cart, $13 to walk. 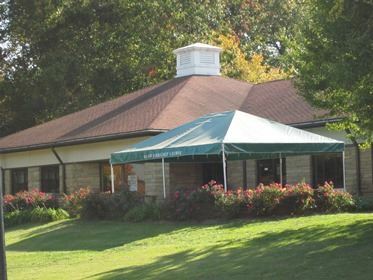 Blair Park Grillroom offers daily lunch specials on weekdays. You can even call ahead for takeout orders! View the specials (PDF). Grillroom hours are 7:00am-5:00pm, daily. The site for Blair Park was a gift to the city from descendants of Solomon Blair. Today's modern 18 hole facility was originally constructed as a nine hole course in 1931, with a second nine added in the mid-1940s. A favorite course with area golfers, this golf course has been the host to many local Golf Championships. The course is traversed by numerous creeks that come into play on over half of the 18 holes. Bunkering is Blair Park GC modest but strategic. The course offers numerous opportunities to go-for-broke, but will punish the errant gamble. Blair Park is an affordable, well maintained public course that provides something for every player no matter their skill level. Many notable golfers have visited the course, including golf legend Sam Snead who played an exhibition round in 1948. Blair Park is a challenging but fair layout, rich in tradition and will test all of your golfing skills. We hope its beauty and superb conditions will make your experience here a memorable one. For more information or to schedule a tee time, visit the Blair Park online resource.